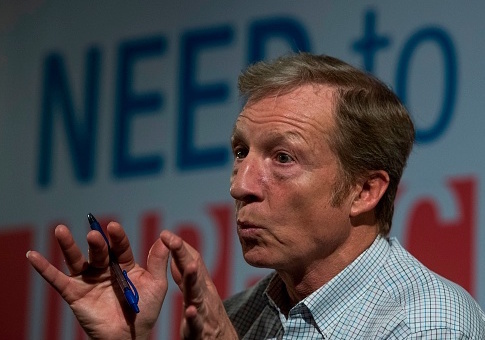 The "Need to Impeach" campaign funded and run by billionaire political activist Tom Steyer has launched a new television ad designed to pressure newly elected members of Congress and gain their support for impeaching President Donald Trump. According to a list of new house members compiled by OpenSecrets.org, 57 of the freshmen are Democrats and 33 are Republicans. But the Steyer ad appears to be more focused on swaying the Democrats. "Americans rose up this November and rejected Donald Trump," Steyer says in the TV ad. "More unhinged by that than ever, this President declared war on the rule of law. But you gave Democrats the power to hold him in check. A majority vote in the house can impeach him and expose his lawless behavior for all to see. They just need the will." As Steyer says those words in the commercial's audio, the onscreen graphics show many of the freshman Democrats. According to the Need to Impeach website, the campaign will also launch an "eight-point plan" to guide Congress through the next two years leading up to the 2020 elections. Many of the representatives targeted by the ad were supported financially by Steyer through his campaign contributions and voter mobilization efforts as part of his plan to help Democrats retake the House. However, an official with the campaign said the two things—his campaign support and whether the elected official would support the impeachment effort—should be kept separate in voters' minds. "Impeachment has never been a litmus test for Tom's support of candidates who are willing to protect and represent the will of the people who voted them into office," said Erik Olvera, communications director for the Need to Impeach campaign. "Nearly 80 percent of Democrats believe Donald Trump should be removed from power. At Need to Impeach, we are continuing our work to lift up the voices of millions of people across the country and ensure they are heard across Capitol Hill." When the Need to Impeach campaign began a series of town halls last year, targeting Democrats who were squishy on impeaching Trump was on the table. For example, at a town hall held in Arlington, Va., last March, Steyer told the small crowd to examine the impeachment stance of Democratic congressman Don Beyer. "I think for the Democrats, obviously … I mean, the representative of this district, Don Beyer, is not in favor of impeachment, even though I think there are 90,000 people from this district who signed our petition," Steyer said at the town hall attended by the Beacon. "This is a heavily Democratic, progressive district. So I would say to you, I don't know that much about Congressman Beyer, I'm sure he's a good person. I think you guys should ask him for the reason. I think it's a very legitimate question as constituents to ask, ‘If this is the number one issue of the day, what is it about this president that makes you want to put up with this kind of lawlessness for another day?'" Shortly after it was known Democrats had won a new majority in the house, Rep. Nancy Pelosi, likely the next speaker of the house, said she leaned against impeachment. "It depends on what happens in the [special counsel Robert] Mueller investigation, but that is not unifying and I get criticized in my own party for not being in support of it. But I'm not. If that happens, it would have to be bipartisan, and the evidence would have to be so conclusive." This entry was posted in Issues and tagged Donald Trump, Tom Steyer. Bookmark the permalink.